In summary, enterprise transformation is no longer only about changing or improving offerings. Delivering new offerings is only one level of change. Balancing offerings to adapt to market perceptions and economic/market changes is a more important strategic imperative. Similar to the decision to embark on a family adventure, your company may be contemplating a transformation. What drives change? Your organization may be facing competition, a need to comply with regulations, customers who demand a more efficient/effective user experience, or several other motivations to initiate a transformation in your organizational processes: both internal, and/or external. When making this decision, there are several factors to consider to ensure success, and it is best to take a structured approach when attempting something of this magnitude. Comparable to the preparation of our backpacking journey, you must plan for an organizational transformation. Prior to planning the steps to complete transformation, you need to set objectives. It is critical to understand your organization’s objectives, define the milestones, and recognize when you have achieved these objectives. This phase is key to reinforcing and sustaining the transformation itself. You need to determine the outcome you are trying to achieve. If you don’t know where you are going, you can get into trouble. Similarly, during our trip, if we didn’t follow the map and reach our daily destinations, we would not have had a place to setup camp. There is a difference between hike lasting a few days in Washington State, and climbing Mount Everest. If want to see a more extreme example of how a Mount Everest summit journey compares to business transformation, please see a related article Surviving the Business Transformation Death Zone. Once you have set your objectives, you need to plan the steps to meet them. To do this, you will need to anticipate the upcoming change, facilitate the steps needed to complete the change, and create an ‘agenda for action’ (per Samuel Bacharach, Professor, School of Industrial Labor Relations, Cornell University (McKelvey-Grant Professor in the department of Organizational Behavior at Cornell University’s ILR School)). When creating the agenda, determine the path you want to take, like mapping out the trail in our family backpacking adventure. Determine the changes, priorities and path to transformation. As part of that plan, you need to become aware of your organization landscape, and if there are any potential roadblocks or resistance throughout the organization. It is helpful to provide communication throughout the process so people at all levels of the organization feel they are a part of the change, and understand their associated role. 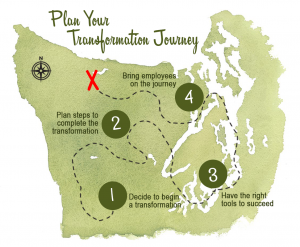 When planning your journey to transformation, you will need to include steps for all levels of the organization. It is important to consider the impact on your peers, at the executive level, as well as your strategic vision. You and your executive peer group are a key part of the plan, driving the change from the top, down. In addition, you will need to be aware of the effect the change will have on the mid-level and low-level personnel in your organization. Based on this, your plan should include tactical and functional aspects, so people in those roles in the company, feel included and see the value of the change. As you need to ensure you have the appropriate items in your packing list and know the route you will follow on an outdoor expedition, you need to plan for this transition, including potential options in case the path diverges from the original idea. Once you have developed your agenda and plan of action, you want to be sure you have the correct tools to lead this transformation. Plan for your desired route from the current to future state, but ensure you have included contingencies for opposition, and how to gain the trust and acceptance of those who may not be initially on board with the changes. Survey your organization to determine if there is any potential resistance to the transformation. Based on the results, plan for these potential roadblocks along the way. 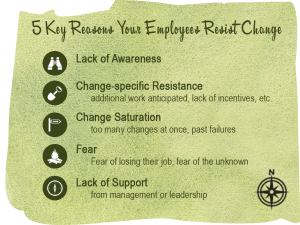 Change-specific Resistance – additional work anticipated, lack of incentives, etc. Develop a communication and resistance plan at the beginning of the project, and constantly revisit that plan to adjust it as needed. Become acutely aware of your surroundings to develop a first-hand view of how people are reacting to the changes, as the project progresses. This way you will be able to identify and address any resistance as it arises. As we researched and planned for our trip, we found pictures of the beautiful landscape we would be exploring along the way. This helped to pique our interest and build our enthusiasm for the adventure. In this same manner, to improve your chances for success, you will need to get your team excited about the transformation and its benefits. Shaul Oreg (associate professor of organizational behavior at the School of Business Administration of The Hebrew University of Jerusalem, currently on Sabbatical at Cornell University) has done a lot of research on dispositional resistance to change. He has determined people react differently to change based on their personality. Some people are more comfortable with routines, and others shy away from the daily habits. They may also react favorably or unfavorably, based on their comfort level. Per Shaul, “Another aspect is about people’s cognitive rigidity or a form of stubbornness…explains why some people are more resistant to change than others.” These characteristics of dispositional resistance to change determine if people will be receptive or oppositional to change. It is critical to keep this in mind when embarking on a change initiative. Once people realize you are considering the impact of the change on them, and you work to inform them, give them the tools to succeed, and address their concerns in different ways, they should be more willing to actively participate in the change activities. If you follow these guidelines, you will increase your chances of success and reduce the chances of being another failed statistic. 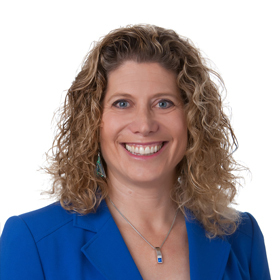 Alyssa is a Certified Project Manager (PMP) with 20+ years of experience as a Senior Business Analyst/Project Manager, with extensive experience implementing private and public sector applications. Recent clients include utility companies and several Arizona state agencies implementing organization-wide digital transformation efforts. Alyssa earned a BS in Management Information Systems from the University of Arizona, Tucson, Arizona.